An engine is one of the most important components on your vehicle. Without it, your car is essentially a high-end bus stop as you wait for the city metro to take you where you need to go. Taking caring of your engine should be your number one priority in ensuring that your vehicle continues to function reliably. That being said, to promote the goals and get the most out of your vehicle, you should avoid these 5 things that can mess up your engine and leave your car permanently out of service. The main job of oil is to lubricate the pistons in your engine as they move back and forth effortlessly. If you never change your oil, eventually whatever oil that doesn't burn away is going to be inundated with miniscule metal and dirt particles that are going to get in the way of these pistons and cause friction. Without proper lubrication, this friction will generate intense heat that will begin to weld together the metal parts in the engine and result in an engine that seizes up and no longer works. Every time you fill up at the gas pump, pay close attention to what type of fuel you are putting into your car. Vehicles that need unleaded fuel will have some serious repercussions if you happen to accidently fill the tank with diesel fuel. Diesel fuel requires higher temperatures and pressures to ignite, and some vehicles cannot exert the necessary levels to power the engine. This will clog your fuel lines and can damage the engines timing cycles. Much like how the oil in your car keeps the pistons lubricated and moving, the coolant is responsible for keeping everything, well…cool. When the engine is rubbing metal against metal and generating heat, the coolant is responsible for bringing down the temperatures and keeping them to a manageable level so that the engine doesn't overheat and break down. A pump built into your vehicle will take all the water or antifreeze in your coolant tank and circulate it through the engine cooling off the heat that is being generated. 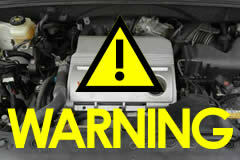 That coolant is then re-cooled by the radiator and follows a repetitive cycle as you are driving. Driving around with a dusty air filter is like trying to sprint a marathon with asthma. If you don't change out your air filter regularly, it will become harder and harder for the engine to take in the proper amount of air that it needs to operate. This will force the engine to work harder to achieve the same amount of power and speeds. An average engine requires 8 parts of air for every part of gasoline that it burns to operate. Any air filter is a relatively low cost replacement and it beats having to buy a new engine any day. Spark plugs are responsible for igniting the air and gasoline concoction in your vehicle and allowing your vehicle to operate. Every time a spark occurs out of the side of one spark plug, a small gap in the metal is made. Eventually the gap is too large and results in poor performance and inhibits your engines functions. Car manufactures recommend that you change out your spark plugs once every 48,000km (30,000 miles). Failing to change out the spark plugs and instead ignoring this recommendation could result in an increase in emissions that would cause you to fail your vehicle emissions test, or your vehicle to not even start up in the first place.